Download "Email: shravankumar.elguri@gmail.com. 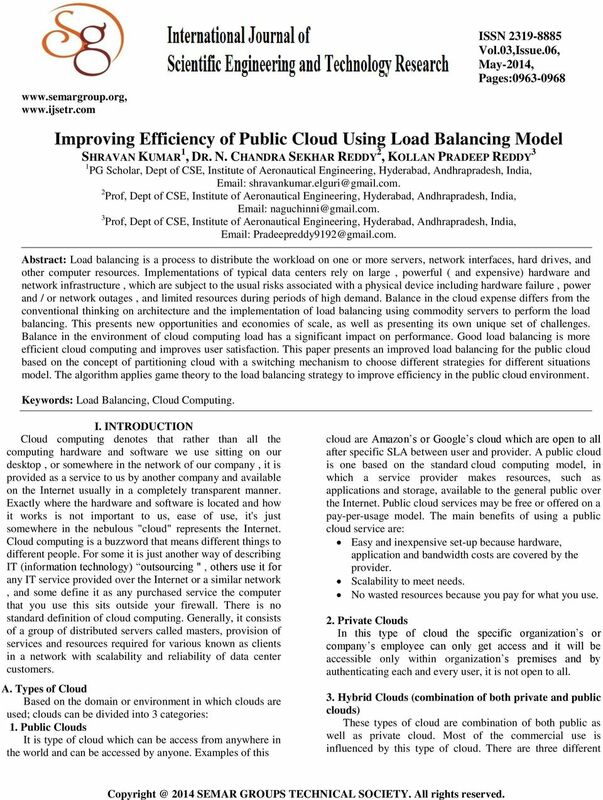 2 Prof, Dept of CSE, Institute of Aeronautical Engineering, Hyderabad, Andhrapradesh, India,"
1 ISSN Vol.03,Issue.06, May-2014, Pages: Improving Efficiency of Public Cloud Using Load Balancing Model SHRAVAN KUMAR 1, DR. N. CHANDRA SEKHAR REDDY 2, KOLLAN PRADEEP REDDY 3 1 PG Scholar, Dept of CSE, Institute of Aeronautical Engineering, Hyderabad, Andhrapradesh, India, 2 Prof, Dept of CSE, Institute of Aeronautical Engineering, Hyderabad, Andhrapradesh, India, 3 Prof, Dept of CSE, Institute of Aeronautical Engineering, Hyderabad, Andhrapradesh, India, Abstract: Load balancing is a process to distribute the workload on one or more servers, network interfaces, hard drives, and other computer resources. Implementations of typical data centers rely on large, powerful ( and expensive) hardware and network infrastructure, which are subject to the usual risks associated with a physical device including hardware failure, power and / or network outages, and limited resources during periods of high demand. Balance in the cloud expense differs from the conventional thinking on architecture and the implementation of load balancing using commodity servers to perform the load balancing. This presents new opportunities and economies of scale, as well as presenting its own unique set of challenges. Balance in the environment of cloud computing load has a significant impact on performance. Good load balancing is more efficient cloud computing and improves user satisfaction. 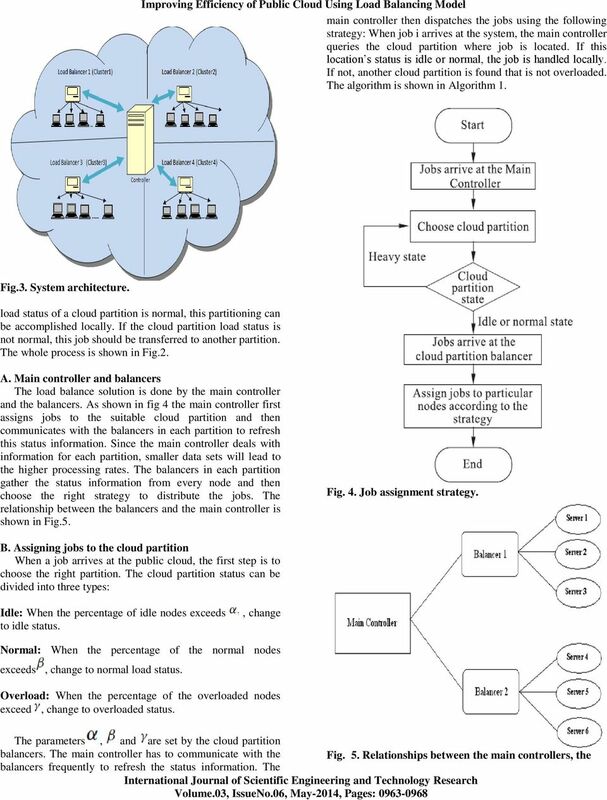 This paper presents an improved load balancing for the public cloud based on the concept of partitioning cloud with a switching mechanism to choose different strategies for different situations model. The algorithm applies game theory to the load balancing strategy to improve efficiency in the public cloud environment. Keywords: Load Balancing, Cloud Computing. I. INTRODUCTION Cloud computing denotes that rather than all the computing hardware and software we use sitting on our desktop, or somewhere in the network of our company, it is provided as a service to us by another company and available on the Internet usually in a completely transparent manner. Exactly where the hardware and software is located and how it works is not important to us, ease of use, it's just somewhere in the nebulous "cloud" represents the Internet. Cloud computing is a buzzword that means different things to different people. For some it is just another way of describing IT (information technology) outsourcing ", others use it for any IT service provided over the Internet or a similar network, and some define it as any purchased service the computer that you use this sits outside your firewall. There is no standard definition of cloud computing. Generally, it consists of a group of distributed servers called masters, provision of services and resources required for various known as clients in a network with scalability and reliability of data center customers. A. Types of Cloud Based on the domain or environment in which clouds are used; clouds can be divided into 3 categories: 1. Public Clouds It is type of cloud which can be access from anywhere in the world and can be accessed by anyone. Examples of this cloud are Amazon s or Google s cloud which are open to all after specific SLA between user and provider. A public cloud is one based on the standard cloud computing model, in which a service provider makes resources, such as applications and storage, available to the general public over the Internet. Public cloud services may be free or offered on a pay-per-usage model. The main benefits of using a public cloud service are: Easy and inexpensive set-up because hardware, application and bandwidth costs are covered by the provider. Scalability to meet needs. No wasted resources because you pay for what you use. 2. Private Clouds In this type of cloud the specific organization s or company s employee can only get access and it will be accessible only within organization s premises and by authenticating each and every user, it is not open to all. 3. Hybrid Clouds (combination of both private and public clouds) These types of cloud are combination of both public as well as private cloud. Most of the commercial use is influenced by this type of cloud. There are three different 2014 SEMAR GROUPS TECHNICAL SOCIETY. All rights reserved. 2 SHRAVAN KUMAR, DR. N. CHANDRA SEKHAR REDDY, KOLLAN PRADEEP REDDY kinds of services provide by cloud computing, where different services are being provided for the user. the balancer for each partition selects the best cloud load balancing strategy. C. Goals of Load balancing 1. To improve the performance substantially. 2. To have a backup plan in case the system fails even partially. 3. To maintain the system stability. 4. To accommodate future modification in the system. Fig. 1: Different services provided by cloud. B. Cloud Service Models As shown in fig 1 Cloud service delivery is divided into three models. The three service models are: 1. Cloud Software as a service (Saas) The capability given to the consumer is to use the vendor applications running on a cloud infrastructure. The applications are accessible from different client devices through a workstation interface such as a Web browser. The consumer does not manage the underlying cloud infrastructure. 2. 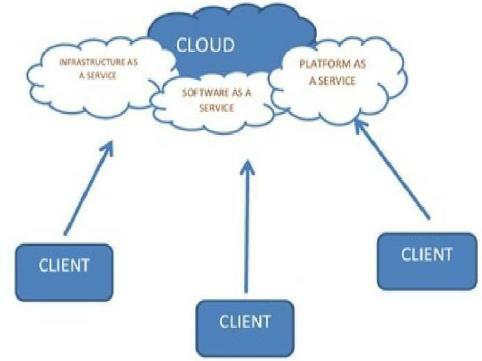 Cloud Platform as a Service (Paas) The capability given to the consumer is to deploy the consumer of the cloud infrastructure created or acquired applications created using languages and tools supported by the programming provider. The consumer does not manage or control the underlying cloud infrastructure but has control over the deployed applications and possibly configuration of the application hosting environment. II. RELATED WORK Good load balancing makes cloud computing more efficient and also improves user satisfaction. This article is aimed at the public cloud which has numerous nodes. A system having main controller, balancers, servers and a client is implemented here. It introduces a switch mechanism to choose different strategies for different situations. 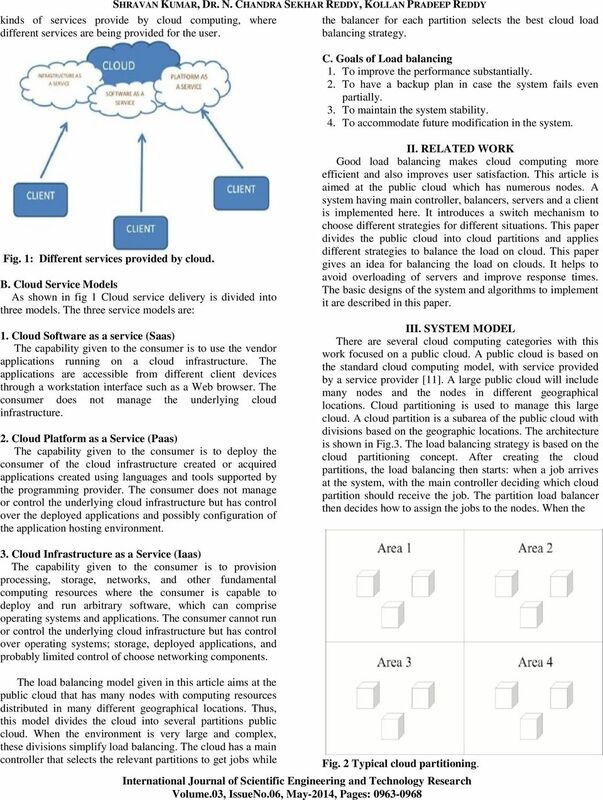 This paper divides the public cloud into cloud partitions and applies different strategies to balance the load on cloud. This paper gives an idea for balancing the load on clouds. It helps to avoid overloading of servers and improve response times. The basic designs of the system and algorithms to implement it are described in this paper. III. SYSTEM MODEL There are several cloud computing categories with this work focused on a public cloud. A public cloud is based on the standard cloud computing model, with service provided by a service provider . A large public cloud will include many nodes and the nodes in different geographical locations. Cloud partitioning is used to manage this large cloud. A cloud partition is a subarea of the public cloud with divisions based on the geographic locations. The architecture is shown in Fig.3. The load balancing strategy is based on the cloud partitioning concept. After creating the cloud partitions, the load balancing then starts: when a job arrives at the system, with the main controller deciding which cloud partition should receive the job. The partition load balancer then decides how to assign the jobs to the nodes. When the 3. Cloud Infrastructure as a Service (Iaas) The capability given to the consumer is to provision processing, storage, networks, and other fundamental computing resources where the consumer is capable to deploy and run arbitrary software, which can comprise operating systems and applications. The consumer cannot run or control the underlying cloud infrastructure but has control over operating systems; storage, deployed applications, and probably limited control of choose networking components. The load balancing model given in this article aims at the public cloud that has many nodes with computing resources distributed in many different geographical locations. Thus, this model divides the cloud into several partitions public cloud. When the environment is very large and complex, these divisions simplify load balancing. The cloud has a main controller that selects the relevant partitions to get jobs while Fig. 2 Typical cloud partitioning. 5 Improving Efficiency of Public Cloud Using Load Balancing Model again. Jobs will then be assigned to nodes with low load degrees. The node order will be changed when the balancer refreshes the Load Status Table. However, there may be read and write inconsistency at the refresh period T. When the balance table is refreshed, at this moment, if a job arrives at the cloud partition, it will bring the inconsistent problem. The system status will have changed but the information will still be old. This may lead to an erroneous load strategy choice and an erroneous nodes order. A flag is also assigned to each table to indicate Read or Write. When the flag = Read, then the Round Robin based on the load degree evaluation algorithm is using this table. When the flag = Write, the table is being refreshed, new information is written into this table. Thus, at each moment, one table gives the correct node locations in the queue for the improved Round Robin algorithm, while the other is being prepared with the updated information. Once the data is refreshed, the table flag is changed to Read and the other table s flag is changed to Write. The two tables then alternate to solve the inconsistency. The process is shown in Fig.6. game has chosen a strategy and no player can benefit by changing his or her strategy while the other players strategies remain unchanged. There have been many studies using game theory for load balancing. 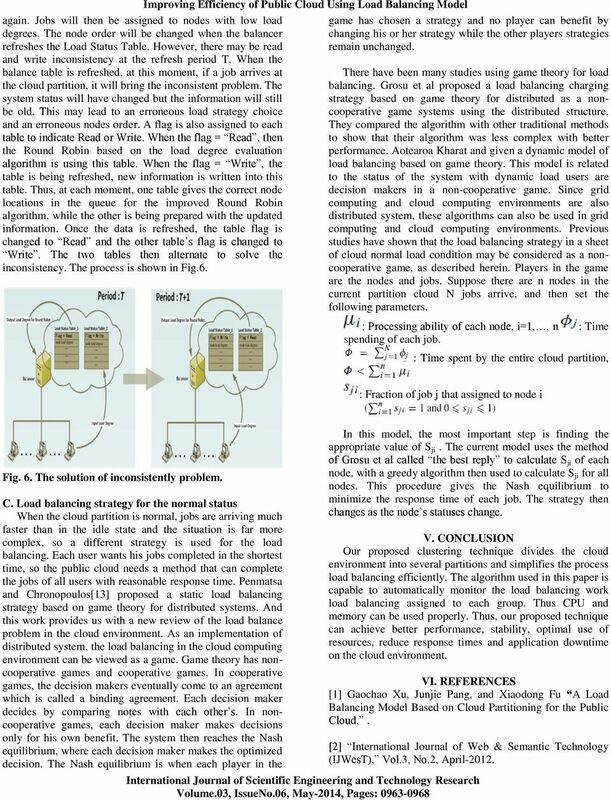 Grosu et al proposed a load balancing charging strategy based on game theory for distributed as a noncooperative game systems using the distributed structure. They compared the algorithm with other traditional methods to show that their algorithm was less complex with better performance. Aotearoa Kharat and given a dynamic model of load balancing based on game theory. This model is related to the status of the system with dynamic load users are decision makers in a non-cooperative game. Since grid computing and cloud computing environments are also distributed system, these algorithms can also be used in grid computing and cloud computing environments. Previous studies have shown that the load balancing strategy in a sheet of cloud normal load condition may be considered as a noncooperative game, as described herein. Players in the game are the nodes and jobs. Suppose there are n nodes in the current partition cloud N jobs arrive, and then set the following parameters. : Processing ability of each node, i=1,, n : Time spending of each job. : Time spent by the entire cloud partition, : Fraction of job j that assigned to node i Fig. 6. The solution of inconsistently problem. C. Load balancing strategy for the normal status When the cloud partition is normal, jobs are arriving much faster than in the idle state and the situation is far more complex, so a different strategy is used for the load balancing. Each user wants his jobs completed in the shortest time, so the public cloud needs a method that can complete the jobs of all users with reasonable response time. Penmatsa and Chronopoulos proposed a static load balancing strategy based on game theory for distributed systems. 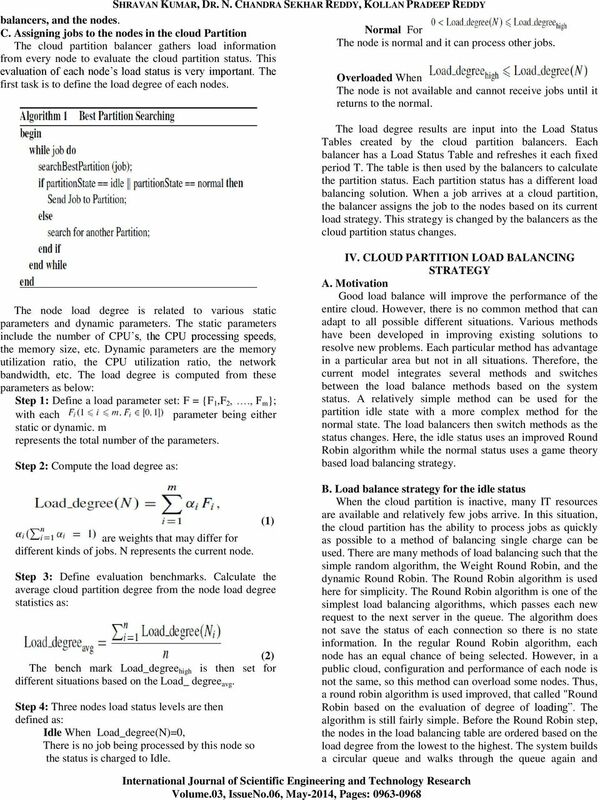 And this work provides us with a new review of the load balance problem in the cloud environment. As an implementation of distributed system, the load balancing in the cloud computing environment can be viewed as a game. Game theory has noncooperative games and cooperative games. In cooperative games, the decision makers eventually come to an agreement which is called a binding agreement. Each decision maker decides by comparing notes with each other s. In noncooperative games, each decision maker makes decisions only for his own benefit. The system then reaches the Nash equilibrium, where each decision maker makes the optimized decision. The Nash equilibrium is when each player in the In this model, the most important step is finding the appropriate value of S ji. The current model uses the method of Grosu et al called the best reply to calculate S ji of each node, with a greedy algorithm then used to calculate S ji for all nodes. This procedure gives the Nash equilibrium to minimize the response time of each job. The strategy then changes as the node s statuses change. V. CONCLUSION Our proposed clustering technique divides the cloud environment into several partitions and simplifies the process load balancing efficiently. The algorithm used in this paper is capable to automatically monitor the load balancing work load balancing assigned to each group. Thus CPU and memory can be used properly. Thus, our proposed technique can achieve better performance, stability, optimal use of resources, reduce response times and application downtime on the cloud environment. VI. REFERENCES  Gaochao Xu, Junjie Pang, and Xiaodong Fu A Load Balancing Model Based on Cloud Partitioning for the Public Cloud,. 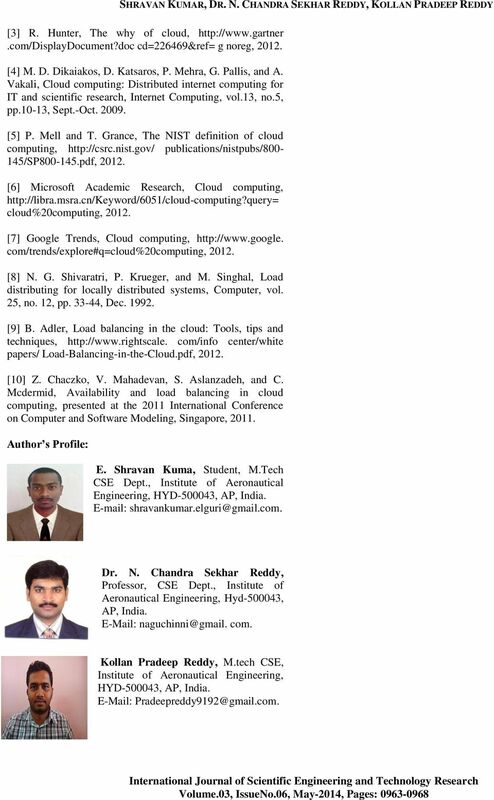 International Journal of Web & Semantic Technology (IJWesT), Vol.3, No.2, April-2012. 6 SHRAVAN KUMAR, DR. N. CHANDRA SEKHAR REDDY, KOLLAN PRADEEP REDDY  R. Hunter, The why of cloud, cd=226469&ref= g noreg,  M. D. Dikaiakos, D. Katsaros, P. Mehra, G. Pallis, and A. Vakali, Cloud computing: Distributed internet computing for IT and scientific research, Internet Computing, vol.13, no.5, pp.10-13, Sept.-Oct  P. Mell and T. Grance, The NIST definition of cloud computing, publications/nistpubs/ /sp pdf,  Microsoft Academic Research, Cloud computing, cloud%20computing,  Google Trends, Cloud computing, com/trends/explore#q=cloud%20computing,  N. G. Shivaratri, P. Krueger, and M. Singhal, Load distributing for locally distributed systems, Computer, vol. 25, no. 12, pp , Dec  B. Adler, Load balancing in the cloud: Tools, tips and techniques, com/info center/white papers/ Load-Balancing-in-the-Cloud.pdf,  Z. Chaczko, V. Mahadevan, S. Aslanzadeh, and C. Mcdermid, Availability and load balancing in cloud computing, presented at the 2011 International Conference on Computer and Software Modeling, Singapore, Author s Profile: E. Shravan Kuma, Student, M.Tech CSE Dept., Institute of Aeronautical Engineering, HYD , AP, India. Dr. N. Chandra Sekhar Reddy, Professor, CSE Dept., Institute of Aeronautical Engineering, Hyd , AP, India. com. Kollan Pradeep Reddy, M.tech CSE, Institute of Aeronautical Engineering, HYD , AP, India. KEYWORDS: Cloud Computing, Cloud Partitioning, Game Theory, Load Balancing, Public Cloud Infrastructure.